Alright, I’ll admit it: adult life has hit full force and my blogging (or lack thereof) has fallen a bit to the wayside. Because, my dear friends who are still living the fantastic life known as college, my day pretty much includes work, possibly working out, making dinner, and sleeping. Exciting, huh? Don’t worry; I’m not going to pull a “work life is hard” again…probably. 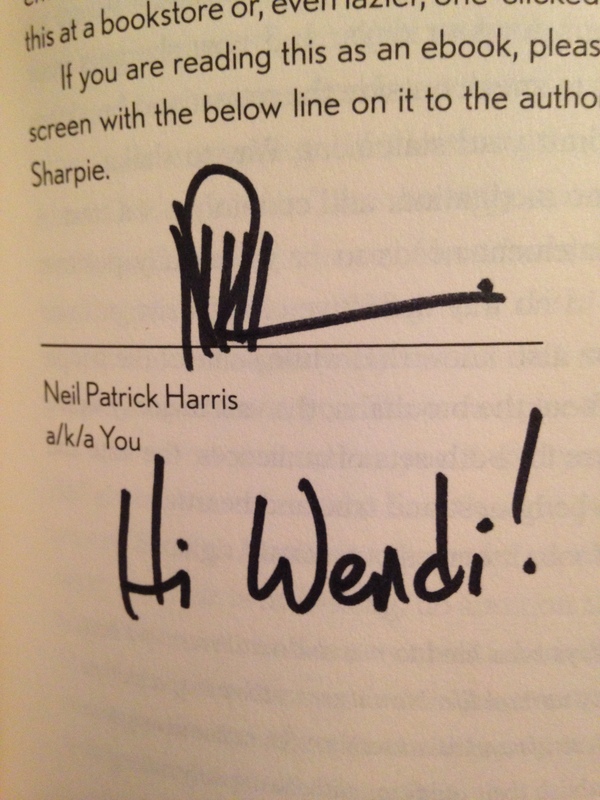 What I am going to do is relive a very exciting evening for this Broadway fangirl last night- when I met the Neil Patrick Harris. 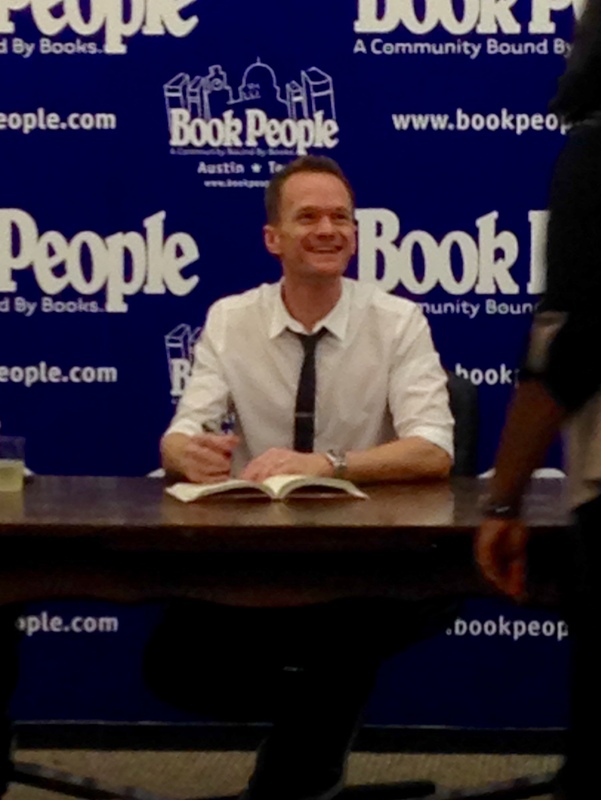 Tony winner, television star, future Oscar host…yeah, that Neil Patrick Harris. And it was legen…wait for it…dary. And then some. Yes, it was probably the quickest book signing/ pseudo meet and greet EVER, and yes, I was fangirling probably way too hard. No shame, y’all. Neil just released an autobiography entitled Choose Your Own Autobiography (which, by the way, I am very excited to read…and only a bit deterred that it’s the first book in a year I won’t be reading on my Kindle- technology, guys). After seeing a tweet that he was going on a cross-county book signing tour, naturally my next step was to anxiously scour the internet, fangirl over his coming to Austin, and purchase my ticket to see him in the flesh at the local bookstore Bookpeople (which I had never actually been to, but after stepping inside have realized it’s pretty much an avid reader’s dream). Being a grown up, I couldn’t get in line for this 7:00 event until around 6:15. As someone who has frequented Twilight (not proudly), Divergent, and Hunger Games midnight premieres, stood in line for the famous Franklin’s Barbeque here in Austin, and rushed Broadway shows for an entire summer, I thought I had seen some pretty intense lines. I was wrong. 45 minutes before the event started, the line wrapped around the store, the building, and the entire shopping center. People had been there since 2:00 pm. Keep in mind this was a ticketed event; every single person with a ticket was guaranteed entry into the event. And people still thought it necessary to get there 5 hours beforehand. At least I wasn’t the craziest fangirl there. I did see a lot of Hedwig playbills (in addition to my own), that, sadly, were not allowed to be signed. The Broadway fans though were a nice reassurance that everyone wasn’t there to simply meet Barney Stinson (though of course that was exciting, as well). At around 7:45, we made it into the building. Of course, the last 20 minutes or so weren’t as boring, as I was jamming along to the Hedwig tribute band while onlookers looked in confusion and asked what kind of band it was. No shame. 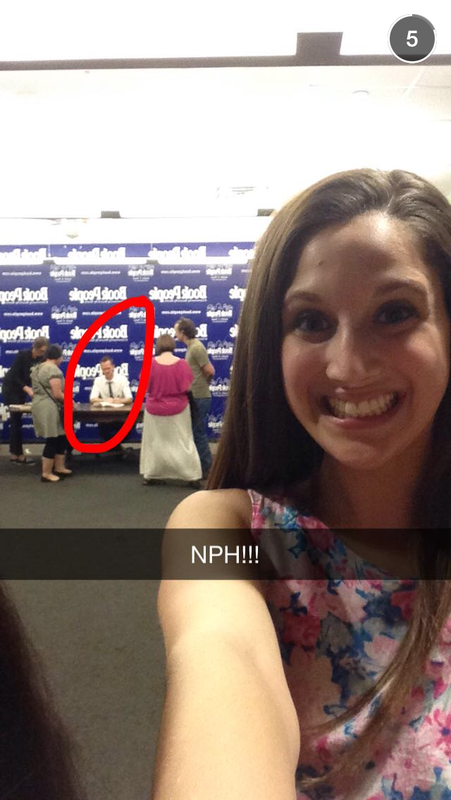 I had never been to a Bookpeople signing before, but damn that place is a well-oiled machine. After reaching the entry checkpoint, a certain number of us were ushered up the stairs to level #2, where an attendant took our names down on a post it and gave it to us to hold. Then, at the level #3 checkpoint, we would slap the post-it onto our book So Neil would know for whom to personalize the book. With over 600 tickets sold, I guess these people know what they’re doing. Even though I’m clearly not, I like to think I’m an expert on meeting celebrities. I stood in line to meet the Glee cast back in 2010, I got a picture with Cory Monteith a couple of years later, I met Jimmy Kimmel during my internship last spring, and I’ve stood by countless stage doors garnering signed Playbills and harassing my dad to “make it a good picture because we only have one shot!” Of course, the no posed photos rules threw a bit of a wrench in my master plan (“Hey, can you hold my phone and take a picture of us as he’s signing my book?”), Which brings me to an important point- make friends in line. We were waiting for two hours; some awkward small talk is a bit inevitable. Be nice, fangirl (not too much- don’t freak them out) a little, and secure a photo-taker. 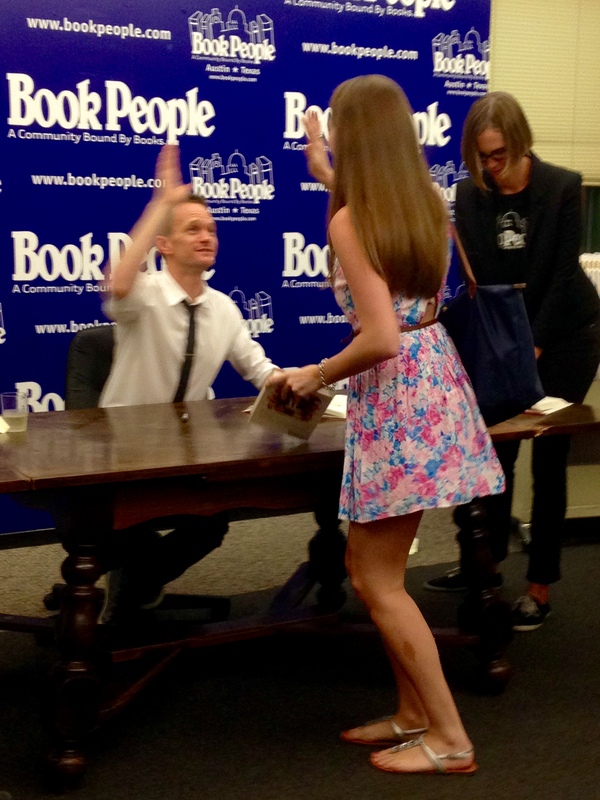 How else would my high-five with NPH himself have been documented? After telling him what an adorable family he had (truth), eliciting a small laugh (of course I died) and requesting- and getting- a high five, I left with a personalized copy of the book I cannot wait to read, and the opportunity to cross off meeting one of my favorite celebrities and biggest celebrity crush (DON’T SAY IT! I KNOW!) off my bucket list. As for my Playbill? I guess I’m stuck with it just being signed by the not-at-all talented, lowly Andrew Rannells. Sarcasm, ya’ll. He’s awesome too. This entry was posted in Broadway, Entertainment, Uncategorized and tagged Academy Awards, Austin, Barney Stinson, BookPeople, Broadway, Choose Your Own Autobiography, Hedwig and the Angry Inch, HIMYM, how i met your mother, Neil Patrick Harris, NPH, Oscars, Tony Award. Bookmark the permalink.